The second of the hand selected “palmas” range (see the Una and the Cuatro) by Antonio Flores at Gonzalez Byass this is an eight year old, en rama big brother of Tio Pepe (5 years) and Una Palma (6). A nice rich yellow gold in colour (would have been a better picture had there been sun today) and a smooth but powerful yeasty or hay bale aroma – maybe just a little bit of olive juice and alcohol in the air too. In terms of mouthfeel it is rich but not too oily. On the palate I don’t find it very expressive – it is a big solid, very well integrated packet of flavour and very long. The flavours are vegetable verging on fruit and to me the salinity is very harmonious. Did I mention how long it is? I wrote those last three sentences (finger by finger on an iphone) and this one since my last sip and it is still there, hanging around. For me, if there is anything that truly characterizes these Palma bottlings it is that they are tidy wines – well balanced and organized, and they keep their shape well. You would say they are not as flamboyant in any attribute as some wines on the market but this is quality, no doubt. 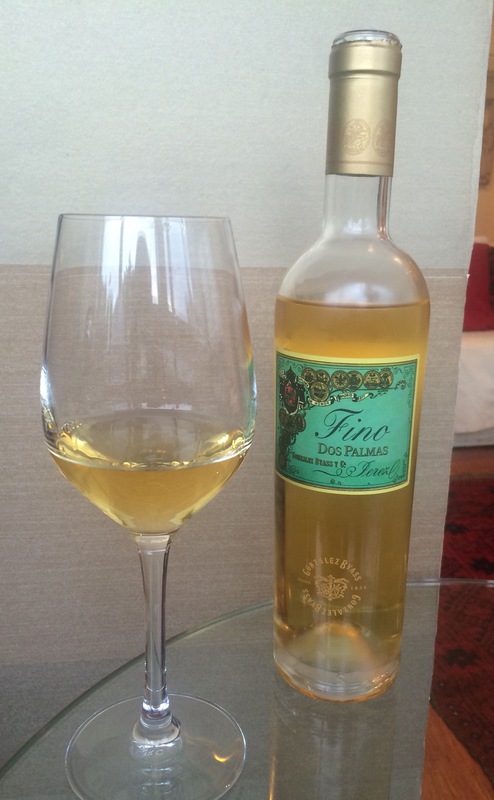 As for this Dos Palmas, it is a style of wine – an older fino – that has its detractors because it seems to fall between two stools. It is neither a fresh young fino (Una Palma) nor a caramelized, zingy amontillado (Tres Palmas). I think on the whole I would tend to agree – unless you go really old (like the incomparably massive, complex giant that is La Panesa) it is hard for these wines to have a really distinctive voice. Having said that, there is a lot to be said for tidy elegance and there is no doubt that this wine has that bit of extra body. Must be ok because it is nearly gone already.